The global shipping industry has for the first time agreed to cut its emissions of greenhouse gases. The move comes after talks all week at the International Maritime Organization (IMO) in London. Shippings has previously been excluded from climate agreements, but under the deal, emissions will be reduced by 50% by 2050 compared to 2008 levels. One minister from a Pacific island state described the agreement as "history in the making". Shipping generates roughly the same quantity of greenhouse gas as Germany and, if it were accounted for as a nation, would rank as the world’s sixth biggest emitter. Like aviation, it had been excluded from climate negotiations because it is an international activity while both the Kyoto Protocol and the Paris Agreement involved national pledges to reduce greenhouse gases. The United States, Saudi Arabia, Brazil and a few other countries had not wanted to see a target for cutting shipping emissions at all. By contrast the European Union, including Britain, and small island states had pushed for a cut of 70-100%. So the deal for a 50% reduction is a compromise which some argue is unrealistic while others say does not far enough. Kitack Lim, secretary-general of the International Maritime Organization, who had chaired the controversial talks, said: "This initial strategy is not a final statement but a key starting point." The tiny Pacific nation of the Marshall Islands had opened the conference with a plea for action. Although it has the world’s second largest register of shipping, it had warned that failure to achieve deep cuts would threaten the country’s survival as global warming raises sea levels. As the talks concluded, the nation’s environment minister David Paul said: "To get to this point has been hard, very hard. And it has involved compromises by all countries. Not least by vulnerable island nations like my own who wanted something, far, far more ambitious than this one." Mr Paul added: "This is history in the making… if a country like the Marshall Islands, a country that is very vulnerable to climate change, and particularly depends on international shipping, can endorse this deal, there is no credible excuse for anybody else to hold back." Laurent Parente, the ambassador of Vanuatu, also a Pacific island nation, was not satisfied but hoped the deal would lead to tougher action in future. "It is the best we could do and is therefore what this delegation will support as the initial strategy that we have no doubt will evolve to higher ambitions in the near future." By contrast, the head of the US delegation to the talks, Jeffrey Lantz, made clear his country’s opposition to the deal. "We do not support the establishment of an absolute reduction target at this time," he said. "In addition, we note that achieving significant emissions reductions, in the international shipping sector, would depend on technological innovation and further improvements in energy efficiency." Mr Lantz reiterated that the US, under President Trump, has announced its withdrawal from the Paris Agreement on climate change. He also criticised the way the IMO had handled the talks, describing it as "unacceptable and not befitting this esteemed organisation." But a clear majority of the conference was in favour of action. 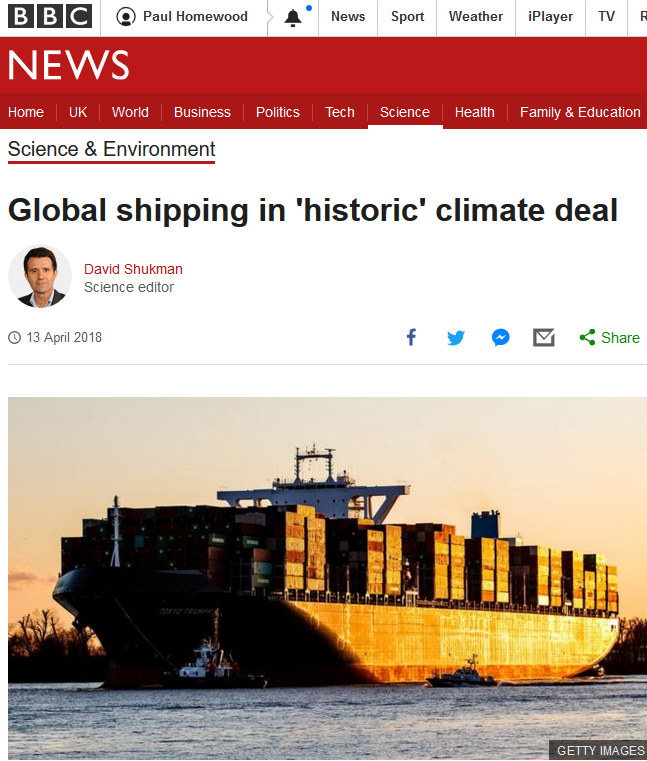 The UK’s shipping minister, Nusrat Ghani, described the agreement as " a watershed moment with the industry showing it is willing to play its part in protecting the planet". The move will send a signal through the industry that rapid innovation is now needed. Ships may have to operate more slowly to burn less fuel. New designs for vessels will be more streamlined and engines will have to be cleaner, maybe powered by hydrogen or batteries, or even by the wind. Ships operating more slowly! Where do they get these crackpot ideas? If they sail more slowly, we will need more ships to carry the traffic, increasing the number of journeys, fuel used, and energy involved in constructing the ships in the first place. Nowhere either does there appear to be any recognition of the fact that, as the world becomes richer, trade flows will grow, and there will be more demand for shipping. As usual with these sort of “agreements”, this one is not quite what it seems. The vision confirms IMO’s commitment to reducing GHG emissions from international shipping and, as a matter of urgency, to phasing them out as soon as possible. Of course, we saw the same fudge at Paris, when all the world declared that they wanted to limit global warming to 2C, but utterly failed to agree on how to actually do it. We have been there before, at Copenhagen, and later at Paris. Developing countries, which of course include China, have no intention of sharing their part of the burden. Worse still, merchant ships can easily switch flags to avoid punitive regulations, making the whole exercise rather worthless. A final IMO plan is not expected until 2023. A done deal? I think not.